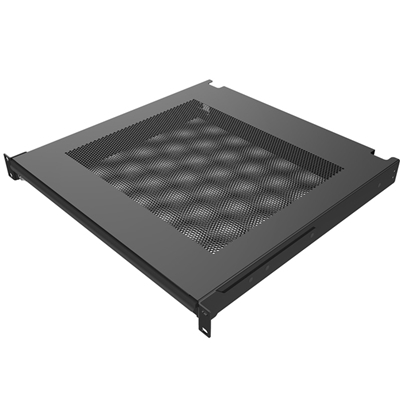 The D3 3-Space Rack Drawer (Black Brushed) is part of the Middle Atlantic line of modular rack systems. 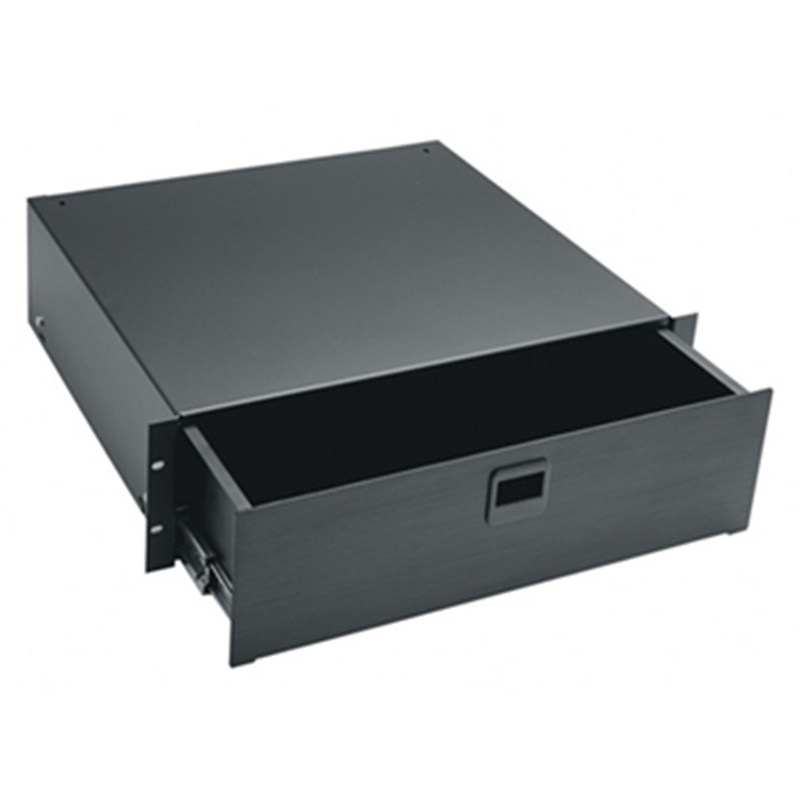 This three-space drawer is fully enclosed with inside dimensions measuring 15.9" wide by 14.5" deep and features spring-loaded latches and rugged, straightforward construction with full extension ball bearing slides. Face plates come with in silver brushed and anodized, black brushed (shown here) and anodized or textured black powder coat finish. An installed keylock is available as an option. Middle Atlantic Rack Drawers are made for heavy use. 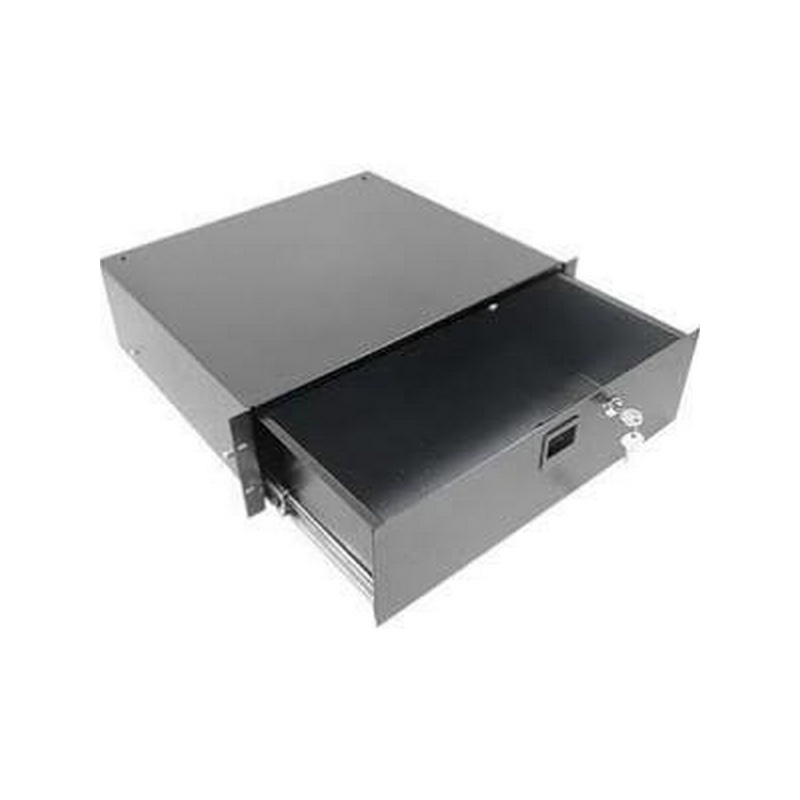 Constructed of steel, this fully enclosed three-space drawer has full extension ball bearing slides extending 14" to minimize friction and the usual wear and tear. It also carries a three-year warranty. 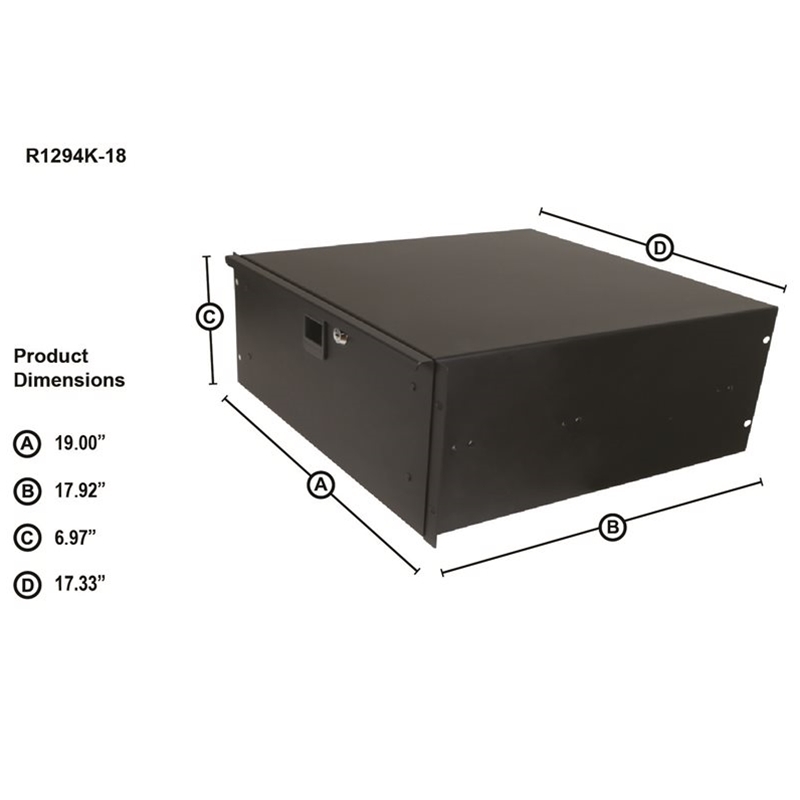 This three-space drawer is designed to fit perfectly with other Middle Atlantic rack modules, allowing you to create the perfect work/storage combination in a rack system. Among the functional assets this draw shares with the five other sizes available is an attractive flush spring latch to keep contents secure closed and laser knockouts at the back for cables to stored pieces inside. A factory-installed lock is optional. Samson's SRK 19" universal rack drawers provide secure, yet easily accessible storage options for your non-rackmountable gear. 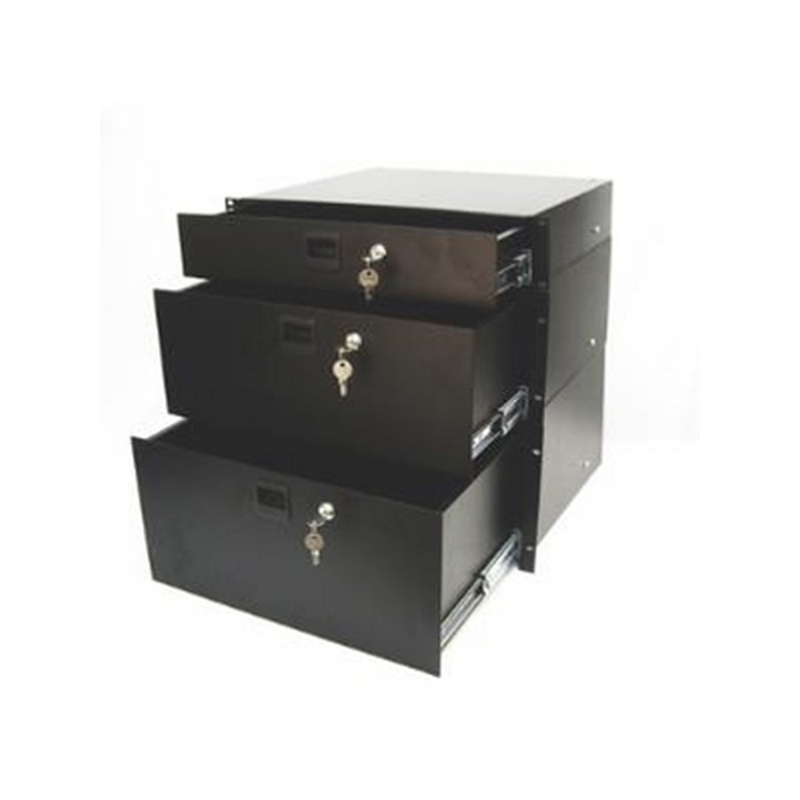 Available in three sizes (2-space [DR2U], 3-space [DR3U], 4-space [DR4U]), these fully enclosed drawers are ruggedly constructed of cold rolled steel plates capable of holding up to 50 pounds of equipment. They each feature spring-loaded latches and heavy-duty smooth glide drawer slides for quiet, effortless opening and closing, as well as a rear grommet for cable access. 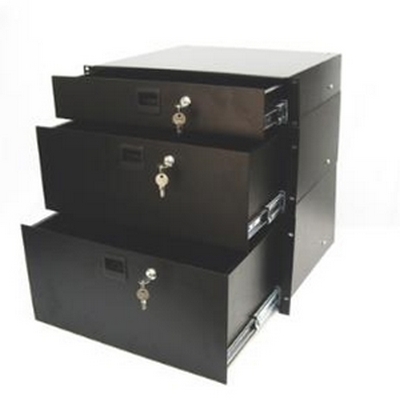 A lock knockout, lock and key are also included with each rack drawer. 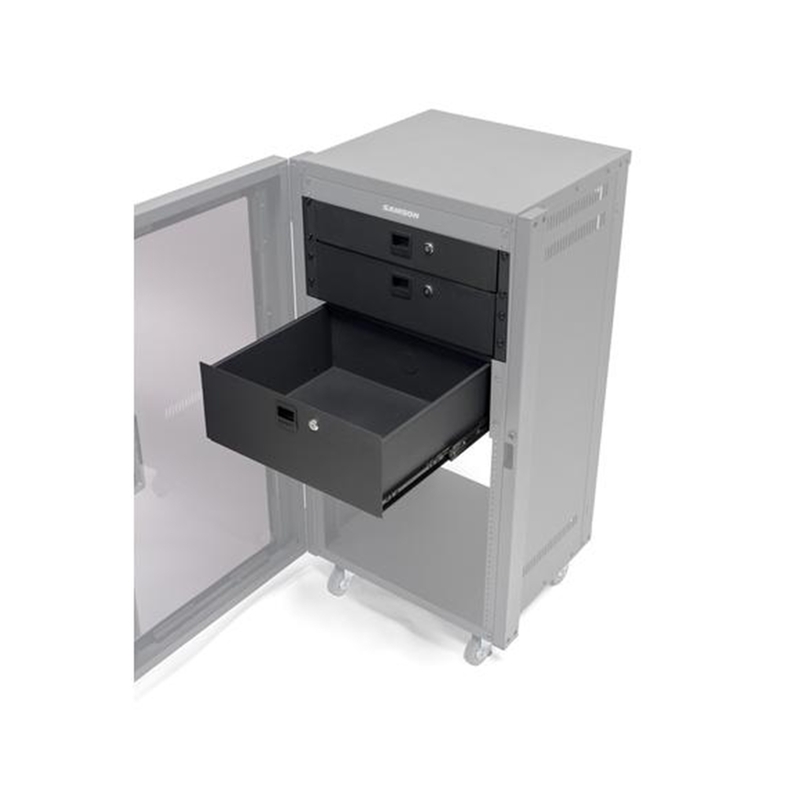 While perfectly compatible with any standard equipment rack, the SRK Rack Drawers are ideal for use with Samson's SRK Racks. 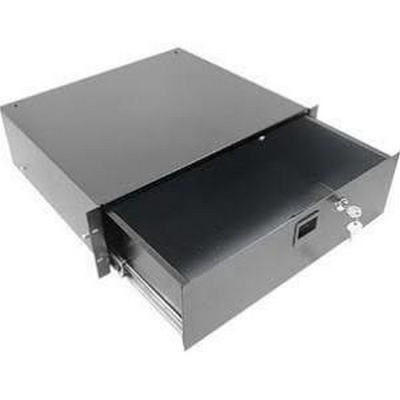 Penn Elcom R1294K 4U Rack Drawer with lock and slam-latch. 14" deep. Size: 19in/483mm x 455.4mm/17.93in Deep. Penn Elcom R1293K 3U Rack Drawer with lock and slam-latch. 14" deep. 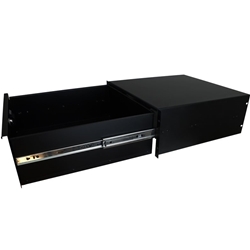 Rack Drawer with Slam Lock, Key Lock and Integrated Front Pull Handle. 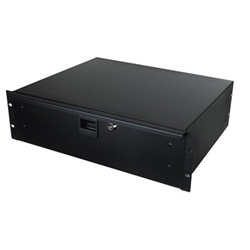 Penn Elcom R1292K 2U Rack Drawer with lock and slam-latch. 14" deep. 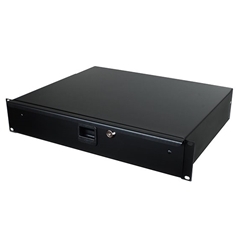 2U Rack Drawer, Lockable, with Slam Lock and Key.